If you're like most people starting out online, WordPress can be quite intimidating. In fact, if you grew up working with HTML websites then the thought of making the switch to blogs can be quite off-putting. The thought of editing a WordPress theme, installing a plugin or maintaining the site is enough to scare off and beginner - and that's even before it's installed! Blogging has several advantages when it comes to creating websites fast - not to mention when it comes to making money online! With a WordPress blog you can post articles and other content on a regular basis from any computer in the world without having to remember your FTP details to upload files! Not only that, but when you do add new content, it's organized nicely so that search engines like Google can pick it up quicky! With a WordPress blog you can monetize it easily with AdSense Ads, ClickBank text links, banners, sign-up forms and so much more to your sidebar which will update all the pages within your blog so you don't have to update each page individually! This alone is a great time saver especially as your blog grows over time! With a WordPress blog you can easily customize and add new fuctional features to it called 'plugins' to allow you to sell products online, review products as an affiliate, build massive mailing lists, and automate repetitive tasks! ...and the best part is that this platform is FREE! All you need is a domain and webhosting and you're good to go - and you'll be able to start your online business! the problem is... how do you use it to it's full potential so you can make money online? Well that's why you're here on this page today! We're going to show you step-by-step how to setup your first blog within a matter of minutes and then teach you how to customize it so that it's ready to use so you can start making money with it! • How to navigate your way through WordPress and mange several options that'll you'll need to use often. 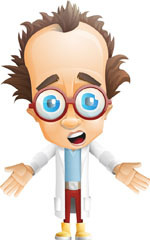 WordPress blogs are dymanic - standard HTML is not! If your site consisted of 100+ pages and you want to change a meta tag, the location of your header image, your site title, or anything else, you'd have to manually go through each file and edit it. With WordPress blogs however, because pages are dynamically created from component files i.e. header.php and footer.php, you will only have to edit one file. This is a massive time saver and very re-assuing knowing that any mistakes or modifications can be taken care of quickly. WordPress is search engine optimized. Standard HTML is not. This is probably common knowledge by now and even if you don't fully understand WordPress you'll have to admit that there are a lot of blogs appearing on the first page of Google for almost any search term you enter. Now there are many features within WordPress that make it so lovable by search engines like Google such as hyperlinked post titles matching your page name, hyperlinked tags, hyperlinked categories, descriptions within the catergories, organized h1, h2, and h3 tags, and so much more. With HTML however, you have to do this manually. If you have say 10 sites on your page with a sidebar linking to other pages, you'd have to manually hyperlink each of those ten links. Then you'd have to repeat the process for each page. Even if you were copying and pasting, it's still an inefficient way of working when a platform such as WordPress can do this all dynamically for you. HTML has no user-friendly way of installing scripts. WordPress however makes script-installing easy with it's plugin system. It's simply a case of browsing for what you want, choosing it and activating it and it's suddenly added into your WordPress admin. No standard HTML site can do this unless there's some serious modification done. But again, why bother going through the hassle when it can simplified? no matter what you want to use your blog for, you'll benefit in some way! Guaranteed! I think you're starting to see the power and advantages WordPress has over standard HTML. And it's no wonder that they're getting more and more popular. Learn to walk before you run and start with the basics. 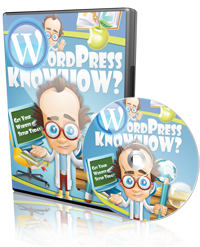 Grab your copy of WordPress Know How now whist it's still fresh in your mind! Get Started Today! You Can Be Watching WordPress Know How In Less Than 90 Seconds From Now! YES Steve! 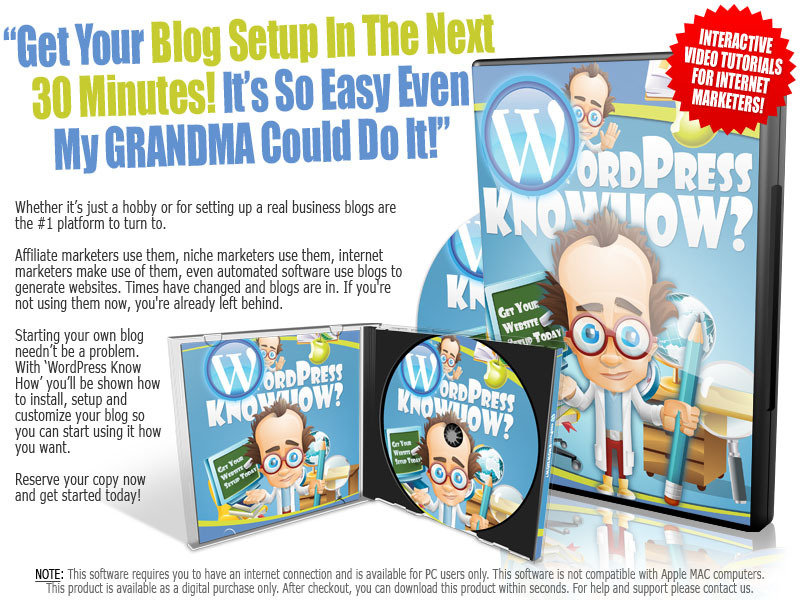 Reserve My Copy Of WordPress Know How Right NOW! YES Steve! Give me instant access to WordPress Know How right now! I want to make a start on my online business or improve on what I've already done and I know that this video course is just what I've been looking for! YES Steve! I understand that this course IS NOT and WILL NOT be available to the masses. I understand that WordPress Know How was created for smart people like me who want to cash in on the online world without everyone having knowing about it! Let me secure my order right now at the best price possible, before it goes up in price or gets taken down completely! And don't forget... this video course is NOT available offline. 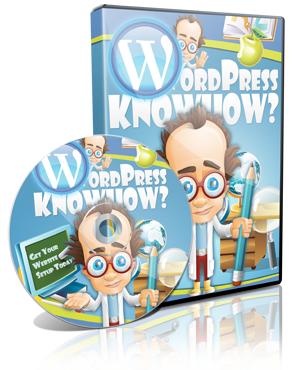 With WordPress Know How you'll finally have the information you've been looking for. And with our discount still on offer, NOW is the best time to jump in on the action! Secure your copy NOW! 2019 WordPress Know How. All Rights Reserved.